The ribs are defined as the paired, curved, rod-shaped bones that have their origin on the dorsal side of the thoracic spine. Together with the thoracic spine and the sternum, they form the bony chest (thorax). The number of the ribs corresponds to the number of the thoracic vertebrae. In total, a human being has 12 pairs of ribs. Each rib consists of an actual rib bone (os costale) and an affiliated cartilage section, the rib cartilage (cartilago costalis). 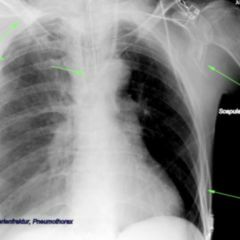 The space between two consecutive ribs is called intercostal space. This space is partly filled by the intercostal muscles. The connection between the cartilages of the 6th-10th ribs is called interchondral joints. The first rib is located below the last cervical vertebra (C7) and the first thoracic vertebra (Th1). In humans, the upper 7 ribs are directly connected to the sternum via the rib cartilage on the ventral side. 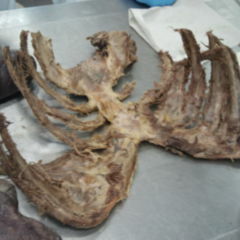 These ribs are also called "true" or sternal ribs (costae verae). The ribs 8, 9 and 10 insert in the cartilaginous costal arch (arcus costalis); they are called "false" or asternal ribs (costae spuriae). 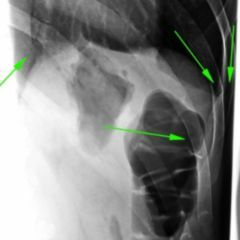 The last two ribs are only rudimentarily developed and end freely in the abdominal wall as so-called "flesh ribs" (costae fluctuantes). The ribs have an articular connection to the vertebral column via the rib heads. Thereby, each rib touches two consecutive vertebrae. Therefore, the articular surface of the rib head (facies articularis capitis costae) is split in two. On the rib neck, you can observe the tubercle of the rib, which articulates with the transverse process of the thoracic vertebra on the same level via a small articular surface (facies articularis tuberculi costae). Not far from the rib neck, there is the angulus costae (rib angle). The flat rib body has a convex exterior surface (facies externa) and a concave internal surface (facies interna). On the inferior edge, the intercostal nerves and the associated blood vessels pass by in a bone groove, the subcostal groove. 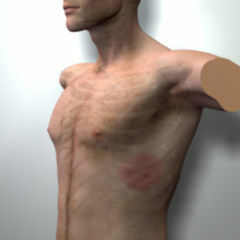 In accidents, the ribs are prone to injuries due to their form and exposed location. 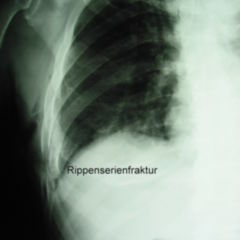 Therefore, the rib contusion and the rib fracture are two relatively common conditions in trauma surgery.